Hello everyone! We're enjoying another snowy weekend and it's just beautiful out! I've been taking pictures of the birds at the feeder and huddled together on the snow ladened tree branches! Then I looked at the IC on SCS and the Etsy sit Geninne's Art Store was all about birds. I used many of the birds for inspiration but I loved the red berries on this on e(#10on this pg.). I decided to make a masculine gift box for my hubby for Valentines Day, using this Able Gable Box template from Leigh Ann Baird. 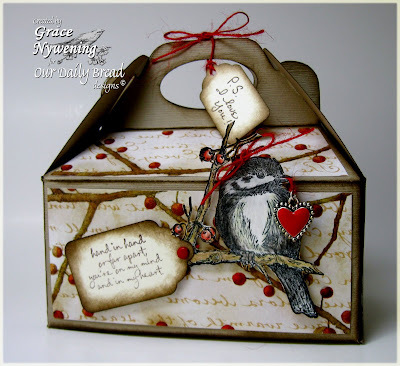 I also used the Chickadee stamp from the Our Daily Bread designs new release, You Will Find Refuge. I paired that with a Studio G sentiment and a hand written tag. The dp is from a new K&Co pad and the base is Kraft, sponged on all panels with THoltz Walnut Stain Ink. I colored the bird just a tad with Prisma Pencils. These new images are so easy to color! I just love them all! This also fits this week's Our Daily Bread designs Shining the Light Challenge #2, to include red or pink and bling on your creation. Since this is a masculine gift, I had to keep the bling down, but used the red charm and brad. I hope that counts. 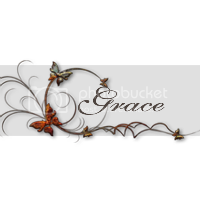 I also used the household item twine, thus qualifying for the Saturday Spotlight Challenge. Inside this box are my hubby's favorite candies... Lindt Dark Chocolate Truffles. Yum! Thanks for looking and have a blessed weekend! OHMYGOSH!!! This is simply GORGEOUS GF!!!! I love every beautiful detail and that charm most of all! WOW WOW WOW Grace AMAZING project girl!!!! You never seize to amaze me!!!!! Have a wonderful weekend!!! Oh I just love this, Grace!!! You've totally inspired me to make a gift box for my hubby! Thank you! So very beautiful, Grace! Love this creation! I might have to invest in some of these templetes! Thanks for sharing! Your DH will treasure this! Great job Grace.. My birds are busy today.. Love this for a chocolate holder..
Oh my! This is stunning! I'm in awe! Grace this is just stunning!!! I love your gift basket! This script paper is just perfect adn the heart charm is the perfect addition to the bird. I love it!!!!! Ohhh wowww Grace,what a BEAUTIFUL box,i love your image and papers. Grace...my sweet friend - your gable box is gorgeous!!! I absolutely love how you've designed/embellished it!!! Absolutely gorgeous Grace! The DP is such a great match for that stamp set. And such a lovely composition. Hope you and your sweetheart have a very nice Valentine's Day. beautiful gable box. The colors, bird and the warm feeling are all perfect. WOW! Gorgeous box of chocolates, Grace! Love some Lindt, too! I just got this paper pack, too! I would love to have this stuff in wallpaper. Hee! Beautifully done! I am sure your dh will love it! Fantastic project- I love the beautiful coloring- the box is so pretty. Happy Valentines Day! What an amazing box, Grace! I love that branch work...reminds me a bit of the cherry blossom trees here before they bloom! Holy moly girl is this stunning!!! I just love that paper with the chickadee!! The heart hanging from the beak is awesome!! Gorgeous girl!! 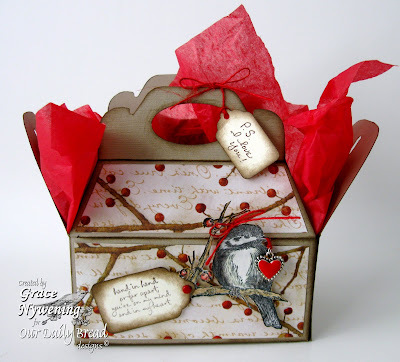 Grace, this is a beautiful box, your paper is perfect with the chickadee and that charm is so precious. A beautiful gift for your hubby! This is just fabulous, Grace! I love your wonderful box. You are named Grace for a reason...your work is graceful and purely ELEGANT! I especially like the two hearts become one card. So, so amazing! Love what you've done here!!! Thanks for joining us at Saturday Spotlight! Can't wait to see what you create next challenge! Gorgeous box! I love that you used twine for your household item!! Thanks for joining us at Saturday Spotlight! Your gable box is so creative and beautiful!! Love what you have done with the bird and that heart charm is so cute! The Season for Singing has come! Our Daily Bread designs Release Blog Hop!